with a life-long love of motorsport. He competed in Motocross and Formula Ford and has passionately followed Formula One his entire life. Combining the two passions has led to a stunning series of fine art paintings that capture the realism and drama of Formula One throughout the ages. Gary’s photo-real painting style combines with a graphic interpretation of keyF1 moments born out of his unique knowledge of the sport, to create dramatic portrayals of Grand Prix racing. 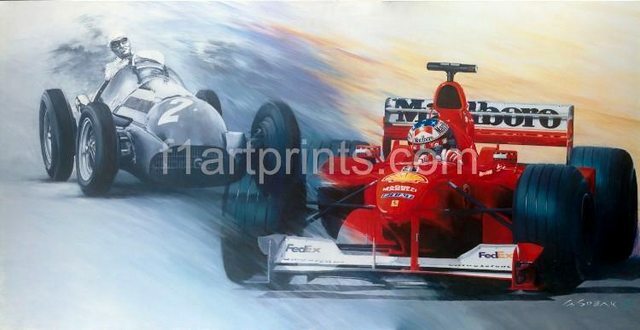 Commemorating the first 50 years of the Formula One World Championship, this dramatic artwork shows Giuseppe Farina winding on the opposite lock in his 1950 championship winning Alfa Romeo 158 Alfetta and Michael Schumacher in the fabulous Ferrari F1-2000. From the drivers’ head positions to the subtle weight shifts of the chassis, this is an accurate, dramatic depiction of these two immense drivers and their cars.